(Newser) – One city in Iowa is rolling out the red carpet for bees in order to save the human race. 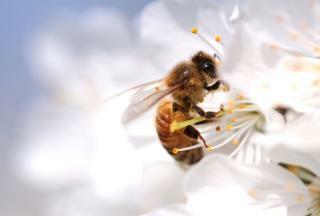 The Gazette reports the population of pollinating insects has been cut in half over the past 70 years, and that spells trouble for humans who enjoy having food to eat. Part of the problem is that the natural habitats of bees and monarch butterflies have been fast disappearing, replaced by parking lots, lawns, and other signs of human development, according to Popular Science. Now Cedar Rapids is hoping to reverse the trend by converting 1,000 acres of unused land into prime bee real estate. Cedar Rapids Mayor Ron Corbett tells the Gazette this project and others like it are "critical to the future of both pollinators and people." Everybody plant milk weed in their back yard for Monarch Butterflies. I always got 'B''s in school...how coincidental. LOL. Nice story...we NEED more B-'students'. More LOL. Missing from this story are 25% of the hole nesting bees that will need habitats that mankind removed. My company (Crown Bees) is working on a "Connect the Native Bee Network" to find what bees should be/are nesting where, learn what makes them survive best, encourage their development, and begin to place these native bees into the nearby backyard micro farms as well as the organic farms nearby.